CKO or Chief Knowledge Officer is a chief person in the company whose job is to ensure that the company maximizes its value from proper utilization of knowledge resources. The CKO must manage intellectual capital as well as take care of knowledge management practices in the industry. Increasingly, the CKO job exists primarily in knowledge businesses such as management consulting, research, and government agencies. Many organizations have already benefited from this role. Are you planning to target this corporate title? Blue Mail Media is happy to help you. We have a list of Chief Knowledge Officers from various organizations residing in different countries. You can reach them as well as interact with them seamlessly with no hassle. Our CKO Mailing List is designed to stay compliant to GDPR and Anti-Spam law. So, stop worrying about the legitimacy of our database. We, at Blue Mail Media, provide you the best email list that lets you reach your entire target CKO’s all across the globe. Our Chief Knowledge Officers Email List guarantees more than 90% deliverability rate with highest accuracy level. We make sure there is no incorrect or irrelevant information in our database. Our team puts significant time as well as effort to create this list with the help of authentic sources. That is, they gather data from trustworthy sources such as yellow pages, business directories, conferences, surveys, government records, and more. Besides, this list undergoes rigorous updates once every 90 days to keep it free from errors and redundancies. That is, they make thousands of verifications calls and send thousands of emails to provide you the up-to-date data. As mentioned above, our CKO Email Database contains all the required marketing information of CKO’s of various regions across the globe. The places include USA, UK, Europe, Russia, Africa, North America, South America, Asia, and others. 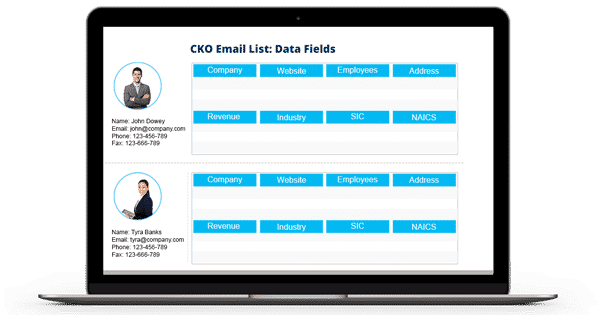 With so many features, our Chief Knowledge Officers Mailing List has helped many organizations in boosting their conversion rate and revenue. Hence if you want to be one among them buy our list now and see dramatic changes in your company’s ROI. Call us at 1-888-494-0588 or drop an email to sales@bluemailmedia.com for any clarifications! Our team of data scientists, analysts, and experts constantly dig out the most qualitative data to power your multi-channel marketing strategies. Also, we ensure that our List of CKO Email Addresses remains accurate and updated by making thousands of verification calls each day and sending out verification emails.